The Dirt Devil SD20005RED Scorpion has an unassuming, basic red glossy design. Though basic, the build is compact, lightweight, and convenient to use for vacuuming. In spite of its unassuming design, the Scorpion carries quite a punch. Its suction level is impressive, such that it rivals suction levels of budget canister vacuums. This is an incredible feat for a hand vac. Moving on, a nifty quick-flip crevice tool and other attachments extend the functionality of the Dirt Devil Scorpion. These accord it the ability to vacuum different forms of debris on different surface types in your car with exceptional efficiency. Perhaps, its most desirable feature aside its suction, bag-less build, and lengthy power cord is its affordable price. You would not find a more powerful handheld car vacuum at a lower price point. Why You Should Buy the Dirt Devil Scorpion? Despite being one of the most inexpensive car vacuum in the market, the Dirt Devil Scorpion sports one of the highest suction levels in the handheld vac sub-industry. For comparison, it features a 7-amps motor, while our top car vac pick (the Black + Decker CHV1410L worth 2x the Scorpion) has a 4-amps motor. Its open secret for the impressive suction is its 16-foot power cord. The CHV1410L is a cordless vac, which explains its relative reduced suction. Regardless, the Dirt Devil Scorpion does give credence to the widely shared assertion that corded vacs offer more suction than comparable cordless vacuums. 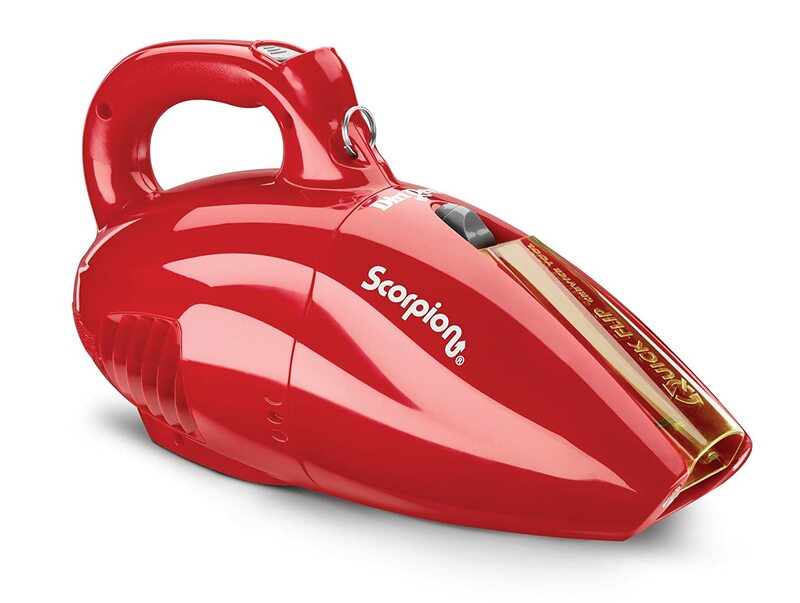 The high-end suction of the Scorpion is responsible for its excellent steady performance. It is able to vacuum tough messes including irregularly sized debris, pet hair, and small pebbles. It is pertinent to emphasize that the performance is steady. Many cordless vacs, especially those with Nickel-Cadmium batteries, are unable to guarantee steady performance. Rather, their performance is similar to that of a rechargeable flashlight. Terrific at first, but faltering after some time. Fortunately, with the Dirt Devil Scorpion, the opposite is the case. The high-end suction remains strong from the start to end of your cleaning session. The Scorpion is a corded hand vac. That does not leave room for bogus convenience as you would with a cordless vac. However, it is the same ol’ compromise playing over again. No restriction in movement but restriction in performance (cordless vacs) versus restriction in movement but no restriction in performance (corded vacs). Interestingly, the Dirt Devil Scorpion happens to find a middle ground. This is mainly because of its 16-foot power cord that offers it the ability to reach virtually everywhere in your car interior, whilst sporting high-grade suction levels. Aside its lengthy power cord, the lightweight (the Scorpion weighs only 3.75 pounds), sleek, and compact build allows you to vacuum all the treacherous corners of your car interior easily. Furthermore, it has a nice built in crevice tool that you can flip to clean dirt in areas that are difficult to access. In addition to the built in crevice tool, the device features a number of attachments that extends the functionality of the device, such as a dusting brush for grabbing pet hair. The Dirt Devil Scorpion Quick Flip Corded Bagless Hand Vac is incredibly easy to maintain. Much of this ease owes to it being a bagless vac. Thus, when you want to empty the dirt container, you only have to twist the center to unlock the vac in half. One half is the dirt container where the dirt collects. The dirt container also houses the filter. When you have detached the dirt container, you can empty its content into a trashcan, and then re-attach it to the vac build to continue vacuuming. The easy maintenance also applies to the filter. You can simply brush off the dirt on it and/or wash it. Then you replace it to its place in the dirt container for continued usage. In any case, when the time comes to change the filter, you wouldn’t have to cough up a fortune as a 2-in-1 pack of Scorpion filters have very low cost. Terrific Performance – High-powered steady suction is a rarity among hand vacs. However, it is exactly what the Dirt Devil Scorpion offers. A comfy, lightweight design, and a quick-flip crevice tool complement the suction to deliver an outstanding performance. Versatile – In addition to an on board crevice tool, the Dirt Devil Scorpion Quick Flip car vacuum offers attachments and accessories for increased versatility. Attachments like the 2.5 feet hose helps the device navigate through tortuous areas of your car interior. While an accessory like the shoulder strap makes vacuuming more effortless. Easy to Maintain – It is remarkably easy to detach the dirt tank. You may then empty the content of and/or wash the detached dirt tank. The filter enclosed in the dirt tank is also easy to dislodge and clean. Affordable – The Scorpion car vacuum is a bargain for the features built in. The top selling points of the Dirt Devil SD20005RED Scorpion are that it is lightweight, compact, has immense suction, is bagless, and yet is insanely inexpensive. It is a great car vac. Although, its AC-only 16-feet power cord may be a bit of a hassle especially for those who would want an always-ready standby car vacuum in their trunk that they can easily use for quick cleaning on the road. You can resolve this by buying a car power inverter. Regardless of this little resolvable bump, the Scorpion Bagless Hand car vac is a pleasure to use and offers tremendous value for the price it commands.